Noorulain grew up in Lahore, Pakistan, and is often found tending to images of the city she loved and left: The River Ravi, old Anarkali, the Lahore Fort, street food, jasmines in her mother’s garden, fireflies, the canal, Daata Sahib’s tomb. In 2003, she moved to California to attend University of California, Davis for her undergraduate degree in Biotechnology. At Davis, she was able to indulge her desire to take creative writing courses for poetry, short fiction, and non-fiction. Noorulain currently works at Roche Molecular Systems and lives in the San Francisco Bay Area. You will often find the sense of being inexplicably incomplete in Noorulain’s own writing, and for her, DWL fills up part of the void that comes as a result of choosing to live away from home. 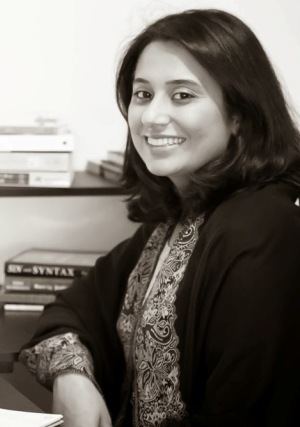 As the Associate Editor of Papercuts, her focus is to ensure that each author’s voice and perspective are persevered in the content culled for the magazine, and her ambition is to showcase and support the compelling work emerging from South Asia and the diaspora. Noorulain is a member of the Squaw Valley Community of Writers and her work has appeared or is forthcoming in Spillway, Sugar Mule, ARDOR, aaduna, Santa Clara Review, Poydras Review, Aperion Review, and other journals along with earning a nomination for the Pushcart Prize. Noorulain blogs at gollgappay.blogspot.com and can be heard musing sporadically on Twitter with the handle @noorulainnoor.